Happy Birthday, Bob - . "Mom, I am very, super excited about my birthday." "I'm four and four-quarters. That means five, Mom." "Are you going to do dressing up like Princess Leia again for my party on Saturday?" "That's so awesome. She has fancy-buns-hair." Ah, and his birthday is so close to Star Wars Day! How fitting. Happy Happy Happy Birthday Bob!! Four and four quarters. My goodness! How did that happen? You make a spectacular Princess Leia. My heart is sort of breaking at how much I love your family. Happy Birthday, dear Bob! Lisa: You make a very, very lovely Princess Leia. Happy Birthday Bob!!!!! and I must say i am jealous of those buns on your head!! lol If only I had, had such a Mom-he is one lucky boy! What a mom. What a Bob. I very, very love this picture. Perhaps my favorite Smacksy picture to date. P.S. My sixth mommy-versary is tomorrow! My Isaiah turns six and was the one who sweetly notiied me that "Hey, it's Mom's special day, too because it was the first day she got to be a mommy." Happy Birthday, Bob and Happy Mommy-versary, You! PS. Leia is kinda hot. I, on the other hand, am kinda awkward. Happy birthday, Bob, and what a rockin' mama you are, Lisa! Oh, Princess, you are lovely. Beautiful Momma. Amazing Bob. Happy Birthday!!!! Happy Birthday Young Bob! And, Lisa, you were born to have awesome buns hair. Love to you all! And you are indeed an awesome mom to dress as Princess Leia. I couldn't pull it off. Princess Leia also oversees the goodie bags. Happy birthday to Bob, and to you too, mom! I want you for my mother!!!!!!!!!!!!!!!!!!!!!!!!!! Happy Almost Birthday, wonderful Bob! You are so grown up now! And so smart too! buns hair, awesome. Happy birthday to the special man! Oh what a five years it has been! 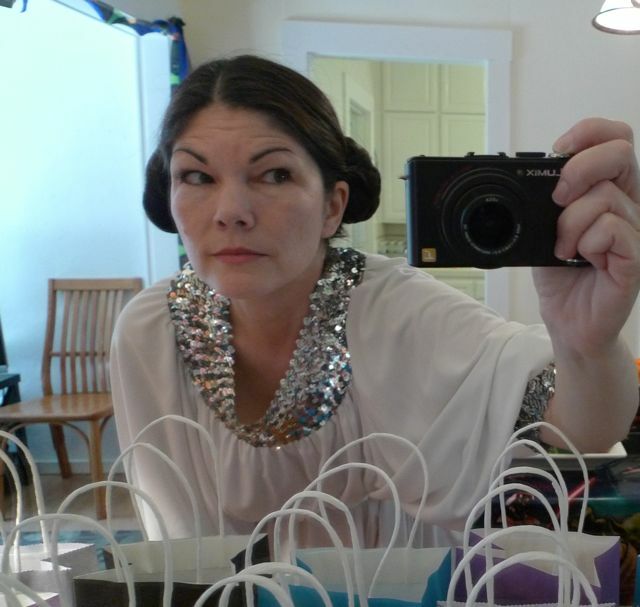 You make an awesome Princess Leia! happy birthday to bob and his fancy buns hair mama! Many, many happy returns of the day, Bob. Happy Birthday, Bob! I'm sure you know this already (since you already know four and four quarters in the same as five) that you have the most awesome Mom in the world.